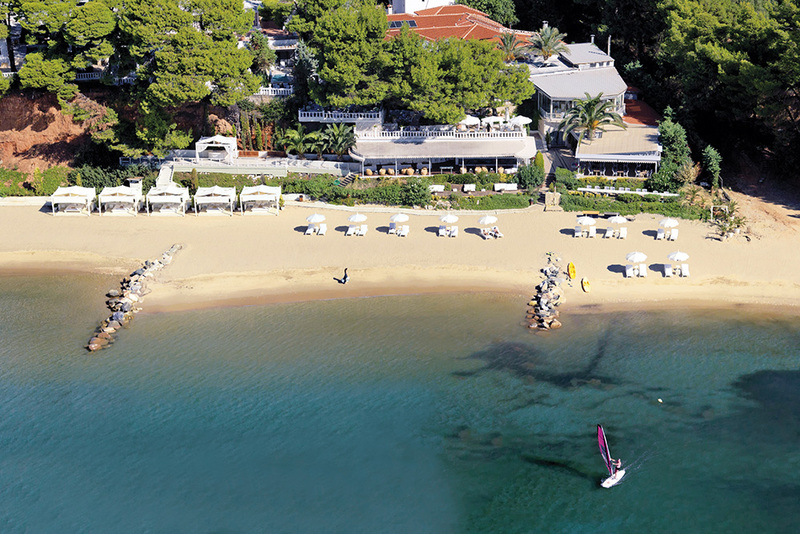 The Danai Beach Resort & Villas, a member of “The Leading Hotels of the World” is surrounded by verdant pine trees, white sandy beaches and clear turquoise waters and is located in Halkidiki, Northern Greece. The hotel offers to the guests a choice of 62 deluxe suites and villas (some suites and all the villas have a private pool on the terrace), each one unique in style and decoration. It has 3 a la carte restaurants with Greek, Mediterranean and French gastronomic cuisine, all of them with great sea views, a seaside bar for drinks during the day and night, a boutique, a jewelry shop and a newsstand. Leisure facilities include an indoor and outdoor swimming pool, a fitness room, a tennis court, water sports and a Wellness & Spa that offers a variety of facial and body treatments, sauna and steam baths. Golf and scuba diving can be arranged nearby. Various theme nights are organized by the hotel as well tours to wineries, boat cruises along the cost of Mount Athos and excursions to famous archaeological sites. The Danai Beach Resort & Villas is in a 50-minute-driving distance from the International Airport of Thessaloniki (SKG) and transfers can be arranged by car, mini bus or helicopter.